Get ready to raise your paddles! The Southern Utah Museum of Art (SUMA) announces the return of the Art Auction to be held Wednesday, March 7, 2018 at 5:00 p.m. at Rusty’s Ranch House. It’s a time-honored tradition that incorporates great food, fine art, and auctioneering fun. Tickets are $50.00 for Friends of SUMA members and $60.00 for not-yet members. Now in its 24th year, the auction began in 1992 to benefit the Braithwaite Fine Arts Gallery and is back by popular demand. Michael Bahr, Education Director, Utah Shakespeare Festival will emcee the event, along with Joe Taylor as the auctioneer. A wide range of media will be featured such as paintings, drawings, photographs, ceramics, jewelry, and other unique works of art by some of the finest artists in the region. Participating artists include: Lynn Berryhill, Arlene Braithwaite, Doug Braithwaite, Eric Brown, Royden Card, Kevin Castro, Jenny Christiansen, Megumi Dold, Yidan Guo, Susan Harris, Brad Holt, Brian Hoover, Mary Jabens, Roland Lee, Glen Lyman, Andy Marvick, Marta Mitchell, Megan Marshall Nelson, Valerie Orlemann, Heath Papa, David Pettit, Micah Player, Michael Plyler, Todd Prince, Jennifer Rasmusson, Ron Rencher, Julie Rogers, Mike Ryan, Kate Starling, Jenny Dawn Stucki, Anna Tillett, Carrie Trenholm, Robyn Twitchell, Katharine Villard, Diane Walsh, Bob Warren, Lyman Whitaker, Mona Woolsey, and Steve Yates. Social hour, art previews, and silent auction begin at 5:00 p.m., followed by the live auction at 6:00 p.m., and dinner at 7:00 p.m. Proceeds will benefit the museum by providing the primary funding for the Summer 2018 exhibition, which will be unveiled at the Art Auction. It will also offer supplemental funding for the museum’s Learning + Experiences team as they develop new programs for the campus and community. 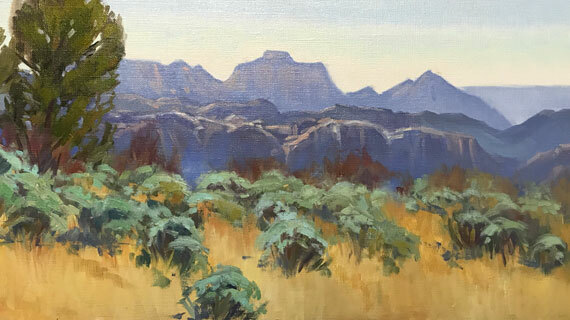 "The Art Auction is an opportunity for both our local artists and members of our community to come together to support the Southern Utah Museum of Art," said Jessica Farling, Director/Curator of SUMA. "In the past, the event has raised substantial funds to support traveling exhibitions and related programming. We are thrilled to unveil this year's exhibition at the Art Auction, which will give our primary supporters a first look at the artist." The Art Auction would not be possible without the support of the Rusty’s Ranch House. The museum also received generous support from local sponsors: Donna Christensen at ERA Realty Center, State Bank of Southern Utah, Colette Cox at Copiers Plus, an authorized sales agency for Xerox, and Artisans Art Gallery. Join the museum for the return of this popular event and bring home stunning artwork while supporting the visual arts in Southern Utah. For more information or to purchase tickets, please visit https://www.suu.edu/pva/suma/friends-of-suma/fundraisers.html.